Swetsville Zoo - In A Colorado Minute (Week 194) [HD] from Luci Westphal on Vimeo. American Roadside Attractions - something about them is quite mystical. They evoke the image of America as an adventure land without borders, crisscrossed by long highways, strewn with fascinating characters on and off the road, traveling like Jack Kerouac or creating quirky works of art and pop culture like Bill Swets did at an Interstate 25 exit in Colorado. Adventure awaits us - we just have to take the highway and go exploring. Following that call, I drove to the outskirts of Fort Collins this week to check out the nearest American Roadside Attraction, according to the website RoadsideAmerica.com: the Swetsville Zoo. What I found were not living animals, but an impressive collection of sculptures made out of scrap metal, mostly from farm equipment and vehicles, all created by Bill Swets. Apparently, he was a farmer and a fireman, who started making sculptures when he couldn't sleep. 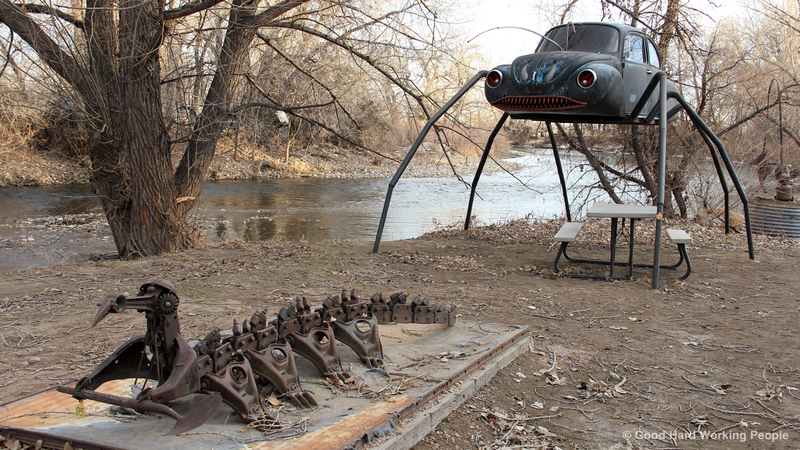 His menagerie of often funny and even political sculptures grew over the years - and remains in its original location at the 265 exit of I-25 (4801 East Harmony Road), along the Poudre River (despite some articles announcing a few years back that it was being dismantled). A charming detail is a list of all the sculptures with their nicknames, "scientific names" and a comments that reveal a special meaning for each of them, like "Speedy" - "rocked-powered turtle" - "There isn't a hare in the world that can beat him" or "Works Neverdone Inc." - "Jake Pulling Ore Cart" - "Works expands to fill the time allotted." As soon as I got there, I was also given a special glimpse into a big hall of amazing fantasy vehicles. There wasn't enough room in the video to show the vehicles as well, but I'll post a few pictures on my Good Hard Working People blog. While this was a great excursion during the winter time, when a lot of the nature sights are a little harder to access due to the snow in the mountains, I definitely want to come back when the trees are green again and the rusty color of the sculptures will pop more. The featured song is called "Drumming on the Walls of the World" and was written and sung by Jason Matherne of Goonygoogoo Productions. Thank you, Bill Swets, for creating and sharing with us your zoo!